We are the first generation in history that will get to know our family tree four to five generations deep. This consists of newborn babies, parents in their twenties, grandparents in their fifties, great grandparents in their seventies and great, great grandparents in their late nineties and over 100 years old. This will become the norm as people like 107 year old Mike Newcomer connect with his genetic downline. This is certainly becoming more present in our practices as we attract more generations of families for chiropractic care. This makes sense considering the importance of a healthy spine and nervous system through every phase of of life. If you are blessed to be able to interact with your family history in this way, don’t take it lightly. Appreciate the history and perspective of your elders. Spend time listening to their reflections of the past and their wisdom while also keeping the perspective that this generation was blindsided by their longevity. Their life expectancy when they were born ninety to 100 years ago was only fifty years. They had no idea they were going to live this long so they didn’t know how to take care of themselves to ensure quality of life as they aged. In cultures like Japan, elders are appreciated more than in cultures like the United States. And their life expectancy is greater for it as well. Elders are not pushed away and pushed into homes as quickly. If you are blessed to be able to have relationships with the elders in your family history, appreciate them. 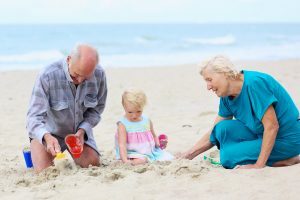 Ask them The 100 Year Lifestyle question that is so relevant for you today, “If you knew that you were going to live this long, how would you have lived differently”? Unfortunately, I didn’t get to know my grandparents very well, and I didn’t get to know my great grandparents at all. They all died fairly young. I was however, very fortunate to know my wife’s great grandfather, Papa Hy. He was a passionate man who was healthy and strong for his age. He loved his family and his community. He kept himself active and healthy. While his diet wasn’t super clean, he was fit for his age and took very little to no medication. He would make it his business to walk. I remember when we brought the kids to visit him in Florida he would get on the ground and play with them. It was a joy to watch. We are getting the advanced notice that our grandparents and great grandparent never received. What will we do with this information? Adjust your lifestyle! The choices you make today, how you live today, will impact the quality of life today and every day along the way. Make today count by making 100 year lifestyle choices. You will have a great day today while you pave the path to a sensational century.